I like the Christmas look for your blog! It looks like you had a wonderful shower! I love that little monkey bib and outfit! Too cute! You are getting so close!! You aren't doing birthing classes are you? I couldn't remember but thought you might not be since we haven't heard about them yet! Yay for 34 weeks!!!! 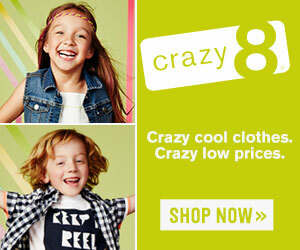 :) Looks like you got some great stuff today! 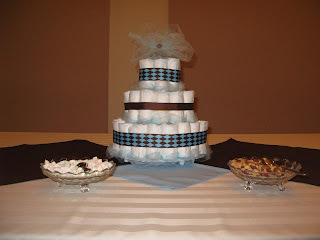 I love the diaper cake too. It looks like you got some great things and a lot of clothes! That is awesome! Looks like Brayden hit the jackpot and will have enough clothes to last his entire infancy!! I know you are ready for him to get here and it won't be long! Take care the last few weeks! These 37 days are going to FLY by I bet!!! Time is just flying ;)! It looks like the shower was a huge success! I hope you got some rest too! 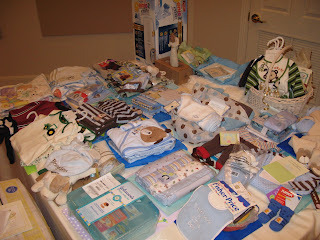 Oh my goodness... looks like you got a ton of great stuff:) he is going to be the best dressed kid around:) So FUN:) gosh i cant believe 37 more days! how exciting!